During the busy holiday season, retail workers will find their shifts extended to nearly a full day, and in some cases working well into the night depending on if shops decide to stay open. However, these longer hours can take a toll on the body, particularly the joints if you’re constantly standing in one spot, like behind a register. Consider adding anti-fatigue mats to behind the cash wrap, where employees can stand on them and get joint relief due to the rubber. Additionally, the anti-fatigue mats are a great addition for reducing the dirt and grime that’s typically tracked in with shoes. This will prevent your nice store floors from getting ruined by all the foot traffic. Because of the rubber material, they’re easy to clean, only needing a simple wipe down with a damp cloth. The holiday season is a busy time for the retail sector, so if there is a spill or a lot of wrapping on the floor, employees will not have to worry about slipping and falling while trying to move between each other and attend to all customers. From both a comfort and safety perspective, anti-fatigue mats are a great addition to the cash wrap station. Anti-fatigue mats can help when there’s a lot of foot traffic. If you’re planning to welcome in a lot of visitors during the holiday shopping season, you may want to consider adding more traction to your flooring, as lots of foot traffic can make a floor slippery. Additionally, if weather conditions outside are poor, chances of residue being tracked in is high. Adding anti-fatigue mats to your entryway and areas of heavy foot traffic is a great precaution to take to ensure that people do not accidentally slip and fall while visiting your store. 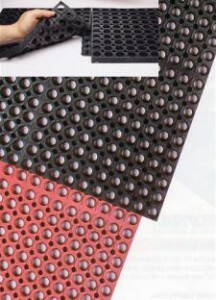 The rubber mats add traction to the floor and can also absorb moisture without increasing someone’s chances of slipping. Not only are these mats a great way to promote safety in your shop, they’re also easy to clean. If you find they’re building up residue from all the foot traffic, simply wipe them down with a wet cloth and allow to dry. This no-fuss method is a great alternative to messing up your expensive flooring. Consider having these mats at any entrance and paths that have seen a lot of foot traffic, including behind the register – because the rubber relieves pressure on the joints, which is beneficial for your employees working long hours. Rubber mats on a restaurant floor can help prevent kitchen spills and are easy to clean. Working in a restaurant is a fast-paced environment, where everyone needs to be on their feet in the kitchen and serving customers. With a lot of food, beverages and foot traffic wearing down the floor, it can be easy for people to accidentally slip and fall. In fact, according to the Occupational Safety and Health Administration, slips, trips and falls are a hazard to working in a restaurant, because slippery and wet floors are so common. It’s critical that restaurant managers work to keep their employees safe by adding traction to the floors with anti-fatigue mats, which are rubber so they are not only easy to clean and provide extra cushion to joints of people who are on their feet all day for work. In addition to adding the rubber flooring of the anti-fatigue mats, it’s a good idea to encourage and educate employees on the importance of proper footwear. According to Food Newsfeed, the best shoes completely cover the feet to protect them from anything that might spill on the job, but also have rubber soles that not only provide support, but also have an extra grip. When doing research, there are certified non-slip shoes that you can point employees to as they’re onboarded. 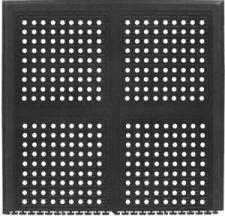 Anti-fatigue mats are easy to clean when residue is an issue. Working with certain materials can be not only a hazard for the floor, but a hazard for the respiratory system or skin. It’s important when working with these kinds of materials to make sure the workspace is easy to clean quickly. Anti-fatigue mats can help, as they are rubber so they are easy to clean and can we wiped of excess residue. Safety and Health Magazine reports that there are a lot of issues that stem from working with wood, so it’s critical that workspaces that deal with the material has proper ventilation to get rid of the wood dust and to frequently vacuum and clean the floors to make sure no dust lingers. By having rubber anti-fatigue mats that are easy to wipe down, you decrease the chances of leaving behind wood dust residue. The Occupational Safety and Health Administration reports that both the skin and respiratory system can have allergic reactions due to wood dust, as well as dryness and irritation. In addition to frequently cleaning, it’s a good idea to make sure your employees are well dressed in clothes that cover their skin and eye and face masks that prevent wood from getting into the eyes and respiratory system.